Three steps away from being funny. Slapstick is probably the oldest form of comedy. When one of our joker ape-like ancestors fell off a log and into a lake, I’m pretty sure its fellow mammals laughed hysterically. It’s always been funny to laugh at others in mild jeopardy, so long as it doesn’t affect us in the slightest. However, if this slapstick ape was transported Terminator style into the future to entertain Sarah Conner with his routines, I doubt she’d be too excited or riveted by his performance. Slapstick may have remained and may still make us chortle, but humour has changed and moved on. Sure, we can still laugh at someone getting hit in the head with a plank (a massive achievement for an ape), but can that one joke sustain an entire film? The Three Stooges puts that to the test. The movie follows the threadbare plot of Moe, Larry and Curly, played by Chris Diamontopoulos, Sean Hayes and Will Sasso respectively, as they attempt to raise the money to save the orphanage where they grew up. Add in a paper-thin murder conspiracy story featuring the buxom Sofia Vergara and… well, that’s it. The 92 minutes are padded out with facial slaps, “zany” sound effects and hammer blows to the head (and shots of Vergara‘s cleavage). None of which remotely tickle the funny bone, or sustain one’s interest. Not even the cleavage. Sofia Vergara – always one to cover up, but not even this will keep your interest from waning. Promise! 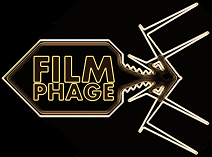 Now, I’ve questioned whether my views regarding The Three Stooges are due to The Phage being of UK origin. Over here, we favour dark, edgy and cringe-worthy humour that’s often unpalatable to US audiences. But I doubt that this is the reason the film fell so flat for me. After all, I enjoy the physical comedy seen in films such as Naked Gun, Dumb & Dumber and BASEketball. I think the real reason is that the film is just that bad. The three main actors all throw themselves headlong into their roles, and they cannot be faulted for their spot-on performance, which is at times quite endearing. But you can’t escape the cold, hard fact that this form of comedy is horribly dated. Silly voices and “thwak” noises no longer cut the mustard with audiences. Not even children. In my screening, there were a couple of boys with their father who were incredibly excited about the movie. Did they laugh? Once. If children that were excited about the movie can only muster a single laugh then it doesn’t say much does it? The three main guys are great in their role… but where are the laughs? I think this was meant to be funny…? The only humorous part for me was the pre-credits scene where two obvious stand-ins for the Farrelly brothers explain to the children that the hammers used in the film were fake, and that the poke-to-the-eyes routine didn’t actually connect with anyone’s eyes. This was funny for three reasons: a) the actors playing the Farrellys were hulking beefcakes – a great sight gag, b) kids are exposed to far more severe violence in cartoons, games and wrestling so the warning was a bit pointless, and c) you’ve got to question how many kids were actually entertained enough to care by this point in the film. Actually, I’m wrong – there was another solitary point in the movie that made me smile, and that’s in relation to Jersey Shore. I won’t divulge any more. Hopefully you can remain awake to that point if you insist on watching. The only reason you can want to see The Three Stooges is for nostalgia, so for non-US audiences, there’s very little reason to see it. It may bring back great memories for those of you familiar with the clowns from your childhood, but for everyone else? Nothing. If you want to see a genuinely funny portrayal of The Three Stooges, then check out the South Park episode called Hell on Earth 2006, where Ted Bundy, Jeffrey Dahmer and John Gacy are charged with getting a Ferrari cake for Satan’s Super Sweet 16 birthday party. Now that is funny. As ever, the comedy world can learn a lot from Matt Stone and Trey Parker. 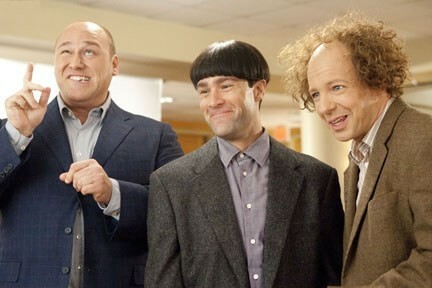 Ultimately, if you’ve seen the trailer for The Three Stooges, you know exactly what you’re getting. Just extend the trailer to 30-fold the length. It’s a constant onslaught of dated slapstick comedy featuring hammers, chainsaws and “boink” sound effects. If this appeals to you, then kudos – this is the film for you. For everyone else who has no affection for the The Three Stooges of yesteryear, then avoid. In fact, I think the only non-fans that would enjoy these antics would be apes – ancestral or not. They’d guffaw at the stooges’ clowning. At least if you distracted those “damn dirty apes” with such vapid attempts at humour then they’d never gain intelligence, rise and take over the Earth. By this reckoning, The Three Stooges is the single most important cinematic effort of a generation. Now there’s a misleading quote for a poster. This entry was posted in Review and tagged Chris Diamontopoulos, comedy, Dumb & Dumber, Farrelly, Sean Hayes, slapstick, Sofia Vergara, Three Stooges, Will Sasso. Bookmark the permalink.